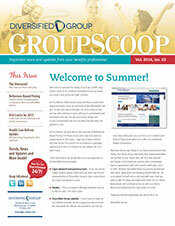 Welcome to Diversified Group’s Summer GroupScoop! Welcome to Summer! For many of us it was a VERY long winter. From all of us here at Diversified Group, we hope you have a very active and safe summer. In this edition of the Group Scoop we discuss some very important topics, such as the future of the Affordable Care Act. As we have said in the past, the ACA is here to stay and we will continue to work with you to understand and implement the law. The law does many things and is very complicated, but the one piece the law does not address is cost. In this edition, we also discuss the concept of Reference Based Pricing. For those of you who have not seen our presentation on this topic, I urge you to take a look in the near future. This portion of our business is growing rapidly and if cost is of concern to you, please call us to learn more. Cigna network transparency tools – If you are on the Cigna network please make sure you reach out to your representative at Diversified Group to learn more about the Cigna transparency tools. Teladoc – This is a program offering telephonic access to doctors, 24/7, 365 days a year. Diversified Group website – If you have not been to our website recently, we encourage you to take a look at the revamped site. We are also excited to say that we now have a blog and you can find us on LinkedIn and Twitter! These tools allow us to offer you additional helpful information. The Uninsured – How many are there and why? Reference-Based Pricing – Interest in these strategies grows as employers seek more affordable options. HSA Limits for 2015 – Dollar limits rise for individual and family contributions.